Three films are made available on DVD for the first time in this collection. Together they illustrate a universal theme of language and identity. 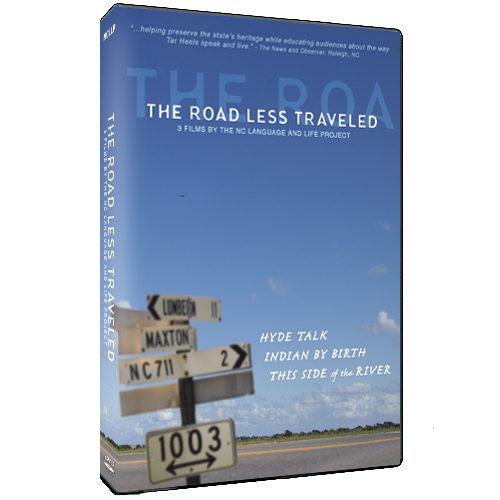 Indian By Birth: the Lumbee Dialect – Stripped of their heritage language generations ago, the Lumbee Indians of Southeastern North Carolina carved out a unique dialect of English to maintain their distinctive cultural identity. 27 Minutes. Hyde Talk: The Language and Land of Hyde County – Hyde County in Eastern North Carolina has long been a destination for hunters, fishermen, and wildlife enthusiasts. Hyde Talk reveals that it is also home to distinctive regional speech, culture and identity. 25 minutes. This Side of the River – by freed slaves in 1865 and incorporated in 1885, Princeville, NC is among the oldest towns in the United States founded entirely by African-Americans. Princeville’s survival through racial prejudice, economic hardships, and devastating floods is an illuminating, and previously untold, chapter of American history. 27 minutes. Longer version also available on DVD.